The Panzer IV tank was the most common German tank uncounted by the Allies as they advanced into Normandy. The Ausf H version of the German Army Panzerkampfwagen IV was fitted with additional spaced armour plating around the hull and turret to protect the crew from Russian anti-tank rifles and US Bazookas. The hull armour 'skirt' and tracks are missing in this exhibit. The Normandy Tank Museum is next to the main N13 (E46) motorway. Set your Sat-Nav to the town of Catz in Normandy and then the road of La Fourchette or Rue de la Fourchette to be directed to the Museum entrance. The German Pz IV Ausf H tank was powered by a 12 cylinder Maybach HL 120 TRM V12 engine that produced 300 hp. It had an operational range of around 200km (120 miles before the crew needed to refuel the tank. It had a top road speed of 42 km/h (26 mph) and 16 km/h (9.9mph) off road. It required a five man crew: commander, gunner, loader, driver, hull machine gunner/radio operator. 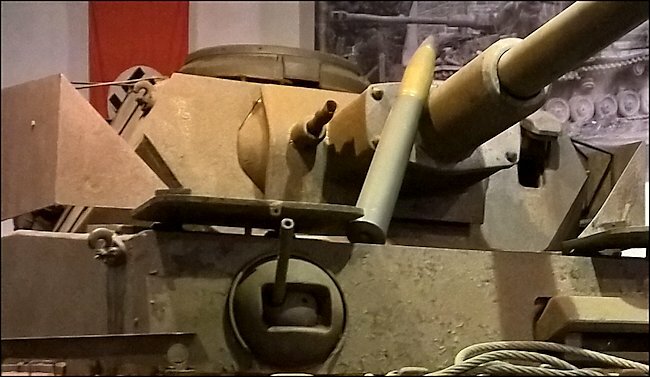 Panzer IV Ausf H tank's 75 mm gun was fitted with a muzzle brake to reduce recoil. It was armed with a long barreled high velocity 75 mm KwK 40 L/48 gun and could store 87 rounds. The gun could fire high explosive HE shells as well as anti-tank armour piercing AP rounds. The gun had an electric firing mechanism and the breech operated semi-automatically which increased the guns rate of fire. At the end of the gun a muzzle brake was added to reduce recoil and extend the life of the gun barrel. The 75mm gun could penetrate the armour of most 1944 Allied tanks frontal armour at a distance of 2km (1.24 miles). It was also armed with two 7.92mm MG 34 machine guns. One was mounted in the hull and the other next to the main gun in the turret. Panzer IV Ausf H tank was armed with two 7.92mm MG 34 machine guns. This late-production Panzer IV Ausf H German Medium Tank is in a poor condition. The vehicle is remarkably intact inside but is missing its auxiliary generator, parts from the engine, radiator, radio racks, radio operator's seat and transformers. It is missing half of both tracks. 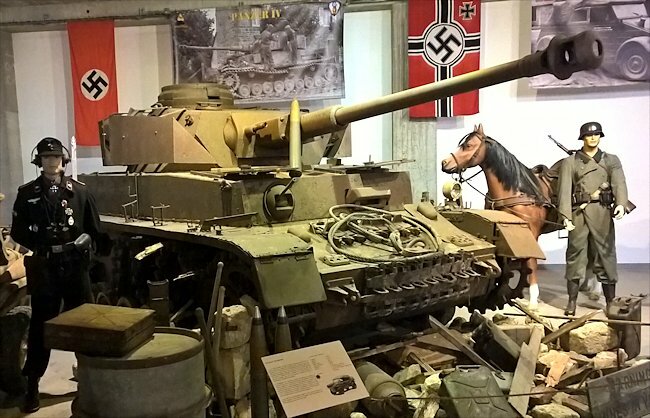 It is believed to have served with either the 22nd Panzer Regiment and/or the 12th SS Panzer Regiment. It took part in the Normandy fighting in June 1944 and was knocked out near Caen by a Canadian unit. An AP round penetrated the hull just behind the right hand sprocket which also damaged the gearbox. After the war it was transported to the military vehicle scrap yard at St Lambert-sur-Dive. In 1948 it was then taken to another scrap yard on the Route de Paris near Le Mans. In 1976 it was rescued from being cut up by the owners of the ‘Musée du 19 Août 1942’. This was a private military museum located on the cliffs to the east of the town of Pourville, east of Dieppe. The tank was not restored but left in a wrecked condition and displayed outside as a memorial to the Dieppe raid of 19 August 1942. 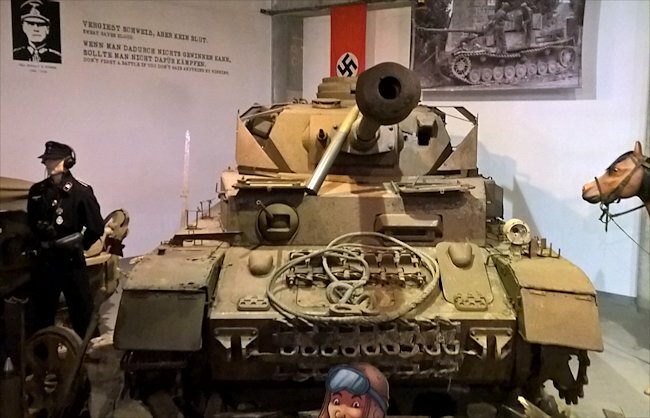 After the Pourville museum closed this PzKpfw IV tank found its way into the Becker collection and finally to the Normandy Tank Museum.